Envoyez-nous votre vid�o de votre d�partement de sciences infirmi�res et nous allons l'afficher sur le site web de l'ACESI. The CASN Public Health Sub-Committee will be conducting a 3 hour workshop at both pre-conferences for Canadian Public Health Association (CPHA) and Community Health Nurses Association of Canada (CHNAC). The purpose of the workshop is to obtain stakeholder feedback on the two key objectives of the subcommittee's work: the leveling of the community/Public Health Nursing Standards for new nursing graduates and tool to assess the quality of community clinical placements. We strongly encourage those who are attending the CPHA and CHNAC conference to also register for the CASN Public Health Sub-Committee workshop. For more information or to register for this session, please click here. June 17th, 2009 1:30 to 4:30 p.m. The CASN Public Health Sub-Committee was formed in 2004 and is supported by the Public Health Agency of Canada. The committee's objectives are: to level Community/Public Health competencies for baccalaureate nursing graduates; and develop a tool for schools of nursing to evaluate practice and assess placements to determine suitability relevant to community (CH) education. The Subcommittee will make recommendations about undergraduate community/public health competencies and processes for achieving them to CASN Accreditation Bureau (CAB) for CASN Accreditation Standards (AS). This position is with the Canadian Association of Schools of Nursing (CASN) and reports to the Board of Directors. To view the job posting for CASN Executive Director, please click here or contact Jo-Anne Swanson jswanson@casn.ca for more information. La personne choisie travaille pour l'Association canadienne des �coles de sciences infirmi�res (ACESI) et rel�ve de son conseil ex�cutif (CE) et de son conseil d'administration (CA). Cliquez ici pour consulter l'offre d'emplois complet ou communiquez avec Jo-Anne Swanson jswanson@casn.ca pour plus d'information. CASN is currently in need of new accreditation reviewers, particularly bilingual reviewers. All interested applicants should submit a completed reviewer application form and updated CV to Michelle Viau at mviau@casn.ca . The role of reviewers is critical to the success and credibility of the CASN accreditation program. Reviewers are expected to assess programs offered by schools of nursing against CASN accreditation standards and identify those programs that demonstrate excellence in teaching and scholarly activity. The commitment of reviewers is to participate in at least two reviews during two consecutive years. As well, reviewers must have: the support of their schools for release time and the authorization of their Dean or Director to participate in a review; and a willingness to devote personal time to training, orientation to the programs to be reviewed, preparation for a review by reading review documentation, participation in the on-site visit(s), and development of the team review reports. For more information on the CASN reviewer role, please visit www.casn.ca, or contact Michelle Viau, mviau@casn.ca , 613-235-3150 ext. 21. Interested reviewers are always welcome to submit their application and CV. This three day conference will provide participants with a broad range of updates in healthcare issues for nurse practitioners. Call for abstracts and posters now open. For more info, click here. Contact Vanessa Mooney should you have any questions vmooney@rnao.org. The World Health Organization's Department of Human Resources for Health (WHO / HRH), in collaboration with the ISI, solicits high-quality submissions of original statistical research results and/or experience focusing on the topic of "Measuring health workforce inequalities: methods and applications". Selected submissions are to be presented at a Special Topic Meeting at the 57th Session of the ISI. To view the program brochure please click here. "60 Years of Inspiring Minds" The School of Nursing Research Committee invites interested persons (faculty, students, nurses) to submit an abstract for a poster presentation at the upcoming Research Conference. Final decisions will be made and presenters informed by June 15, 2009. For more information, please contact shelley.cobbett@dal.ca. Participants will gain knowledge and tools to integrate best geriatric nursing knowledge and practices in their teaching and curricula, ultimately improving nursing care provided by your students and graduates. Through a train-the-trainer approach, Institute participants will be supported to champion evidence-based geriatric content in nursing curriculum within their universities, provincially, and nationally. The event is bilingual (Spanish - English), and will have simultaneous translation in several sessions. The abstracts submissions can also be in Spanish or English. The Community Health Nurses' Association of Canada (CHNAC) and the Community Health Nurses of Alberta (CHNA) are proud to announce the 3rd National Community Health Nurses Conference. Click here to view the online flyer and the registration form. The new ICN Global Nursing Leadership Institute is inviting applications who are interested in participating in the first session. The institute is aimed at Nurses in senior and executive level positions from across the globe in a variety of settings to gain new knowledge from a global perspective to influence changes needed to positively impact health systems, population health and patient outcomes among other things. Institute participants will live in residence during the five day program and all work will be conducted in English. The University of Calgary in conjunction with Canadian Research Institute of Spirituality and Healing will be hosting the 5th North American Conference Multi-Disciplinary Academic Conference on Spirituality and Health. The conference aims to provide a diverse, multidisciplinary, multi-faith forum in order to address spirituality from a broad health focus. Experience in healthcare work has demonstrated that sharing our vision and commitment is key to transformational change. The goal of this 8th International Elder Care conference is to promote and support transformational and sustained change in the Care of Older Persons and in Geriatrics. The conference will explore early childhood, family and community development through the lens of Child Rights. The CNSA Board of Directors met in January 2009 in Charlottetown, PEI prior to the 2009 Conference. There were approximately 400 students at the conference. "Plan to Replace Registered Nurses with Unregulated Workers Will Risk Blood Supply Safety, Says Ontario Nurses' Association"
TORONTO, March 3 - The Ontario Nurses' Association (ONA) says the Canadian Blood Services (CBS) plan to replace registered nurses who perform health screening and assessments of blood donors with unregulated employees will risk the safety of our country's blood supply. "This misguided plan poses a serious risk to the safety of the public as well as to the safety of the country's blood supply," says ONA President Linda Haslam-Stroud, RN. "Those trusted with keeping the supply safe should remember the lessons learned during the tainted blood scandal of the 1990s and cancel this ill-thought-out plan." Click here to view full article. "Federal Funding for Saskatchewan Nursing Project"
SASKATCHEWAN, March 6 /Government of Saskatchewan/-Saskatchewan has today received $284,000 in federal funding for a research project designed to keep registered nurses and registered psychiatric nurses working in the province. The Research to Action - Applied Workplace Solutions for Nurses is a collaborative effort involving the Canadian Federation of Nurses Unions, Health Canada, Canadian Health Care Association, the Canadian Nurses Association and nine provinces. The Saskatchewan Union of Nurses (SUN), the Saskatoon Health Region and the Ministry of Health will examine levels of staffing in order to develop a process to determine a ratio between nurses and patients that is specific to nursing units. In addition to the federal funding for this project, the Saskatchewan government has devoted $103,000, the Saskatoon Health Region $93,000 and SUN $28,000. Click here to view full article. This is a formal request to seek your assistance in recruiting participants for a focus group research study on Internationally Educated Nurse in Ontario. The study's principal investigator is Dr. Sioban Nelson, Dean of the Lawrence S. Bloomberg Faculty of Nursing, University of Toronto. The study's co-investigator is Bukola Kolawole, a PhD student at the Lawrence S. Bloomberg Faculty of Nursing, University of Toronto. Forty percent of Internationally Educated Nurses do not complete the registration process to become to practice as Registered Nurse or Registered Practical Nurse in Ontario. The purpose of this research study is to explore the barriers confronting internationally educated nurses in becoming registered to practice in Ontario. The findings from this study will help inform policy that targets the 40% of internationally educated nurses who fail to complete the application process to become registered to practice in Ontario. To be eligible for this study, the Internationally Educated Nurse must have been previously licensed or registered to practice as a nurse in a country outside of Canada. Also, he/she must have contacted the College of Nurses of Ontario and started the process of getting registered to practice as a nurse in Ontario. The Internationally Educated Nurse must have stopped the process of becoming registered to practice as a nurse in Ontario and must not be currently enrolled in or planning to enroll in any nursing bridging or upgrading program. We are requesting your help to distribute the attached letter of invitation to members of your networks/organization. You can also post the attached posters in strategic locations in your organization. Participation is completely voluntary. Potential participants can contact Bukola Kolawole as specified in the letter. Thank you for your attention to this request. If you need additional information or have suggestions for recruitment, please contact Bukola Kolawole at 647-883-6307 or bukola.kolawole@utoronto.ca. "UNB Shows Off New Nursing Facilities"
FREDERICTON, March 18 /The Daily Gleaner/ - The recent expansion of MacLaggan Hall will help keep the University of New Brunswick's faculty of nursing competitive with other training facilities across the country. University officials marked the official dedication of the expanded hall Tuesday by taking Fredericton MP Keith Ashfield, Post-Secondary Education, Training and Labour Minister Donald Arseneault and other guests on a tour of the new facilities. The $2.7-million project expanded the building to include a new wing that faces Windsor Street and measures about 790 square metres (8,500 square-feet). Click here to view full article. "New Critical Care and Emergency Nursing Program for Prince Edward Island Nurses"
CHARLOTTETOWN, March 23 - The Department of Health, the PEI Nurses Union and the University of Prince Edward Island School of Nursing are partnering on a collaborative project to bring a new Critical Care and Emergency Nursing Program to Prince Edward Island. The program is part of a new initiative, Research to Action: Applied Workplace Solutions for Nurses, being undertaken by the Canadian Federation of Nurses Unions (CFNU) with funding from Health Canada, to improve recruitment and retention strategies through projects in nine provinces across Canada. Click here to view full article. 100% time for research activities? Collaborations with clinicians and administrators? Getting research knowledge into practice - "EIDM"? A PhD with strong research preparation? A post-doctoral program in progress or completed? Then McGill University is interested in you. Click here to view the online flyer or contact judith.ritchie@muhc.mcgill.ca for more information. "British Columbia provides funding to speed up nursing grads"
VANCOUVER, March 25 - The Province is providing a one-time grant of more than $650,000 to Vancouver Community College (VCC) to equip laboratories and support start-up and operating costs for an accelerated three-year bachelor of science in nursing program, announced Murray Coell, Minister of Advanced Education and Labour Market Development. Click here to view full article. 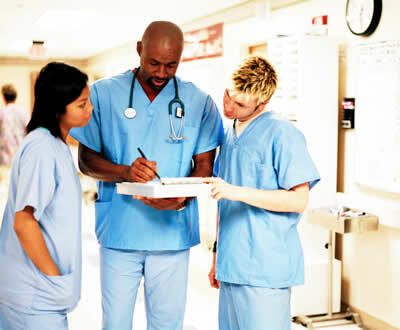 "Budget fails to address nursing shortage: Nurses say"
TORONTO - March 26 - Nurses are disappointed that the budget unveiled by the McGuinty government is a tax cut budget that doesn't adequately address the healthcare needs of Ontarians. The Registered Nurses' Association of Ontario (RNAO) says healthcare is not a sunny day expenditure that can be tossed aside during times of recession. Click here to view full article. "Nurses across Canada are reducing wait times"
OTTAWA, March 26 - A new treatment regime initiated by a clinical nurse specialist in New Westminster, B.C., means cardiac surgery patients have fewer complications and spend less time in hospital. A nurse-managed outpatient chemotherapy clinic in Toronto decreases wait times for treatment. Intervention from a nurse practitioner reduces the need for hospitalization for long-term care residents across Ontario. Nurses working collaboratively with physicians has almost doubled the capacity of some family practices in Halifax. Click here to view full article. La chaire a pour but de d�velopper la recherche �valuative en soins infirmiers et de contribuer au d�veloppement du Groupe de recherche interuniversitaire en science infirmi�res (GRISIM). Cliquez ici pour plus d'info. The purpose of the Chair is to develop evaluative research in the field of nursing and to contribute to the development of the Groupe de recherche interuniversitaire en sciences infirmi�res (GRISIM). For more info, click here. I was coming out of the ladies room. There was an elderly woman attempting to enter the room. Her husband had pushed her - in her wheelchair - right up to the door. But the door was not automatic. She was trying to push the door open - half sitting/half standing - in her chair. That's when I pulled open the door. I caught her by the arm and asked if she needed any help. She simply replied, "Yes." I said I would help and took her hand. I held onto her as we made our way to a stall. I took her right to the toilet. Not wanting to take any chances, I made sure she was holding onto the support bars in the stall before I stepped out to hold the door closed. I told her to call when she was ready to come out. When she called I assisted her to the sink to wash her hands and retrieved paper towels for her. I even threw them away when she was finished as I didn't want her to have to to do anymore than necessary. On our way out of the bathroom she said, "This is such a lovely service. Do you just stand here and do this for everyone?" I said, "Yes, I do it for everyone."